On the 31st (Sat), wander the streets of Belém Tower, then wander the streets of Bairro Alto, then shop like a local with Chiado, and finally step into the grandiose world of Castelo de S. Jorge. To find reviews, where to stay, maps, and tourist information, use the Lisbon trip planning website . Guatemala City, Guatemala to Lisbon is an approximately 16.5-hour flight. You can also do a combination of shuttle and flight. Due to the time zone difference, you'll lose 6 hours traveling from Guatemala City to Lisbon. Traveling from Guatemala City in August, you will find days in Lisbon are somewhat warmer (86°F), and nights are about the same (63°F). Wrap up your sightseeing on the 31st (Sat) to allow time to travel to Rome. Start off your visit on the 1st (Sun): explore the ancient world of Colosseum, then explore the world behind art at Vatican Museums, and then don't miss a visit to St. Peter's Basilica. Get ready for a full day of sightseeing on the 2nd (Mon): make a trip to Pantheon, get to know the fascinating history of Piazza Navona, wander the streets of Trastevere, then make a trip to Trevi Fountain, and finally take in the spiritual surroundings of Chiesa di Sant'Ignazio di Loyola. For traveler tips, maps, ratings, and other tourist information, go to the Rome trip builder app . Traveling by flight from Lisbon to Rome takes 6 hours. Alternatively, you can do a combination of flight and train; or drive. Due to the time zone difference, you'll lose 1 hour traveling from Lisbon to Rome. Expect a daytime high around 81°F in September, and nighttime lows around 60°F. Finish your sightseeing early on the 3rd (Tue) so you can take a train to Florence. 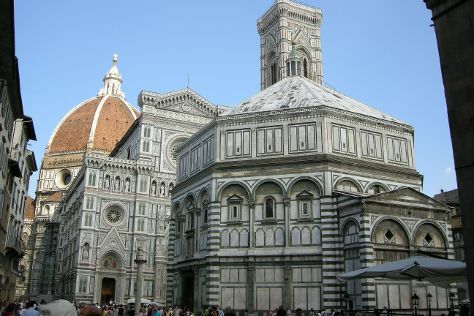 Get a sense of the local culture at Cathedral of Santa Maria del Fiore and Piazzale Michelangelo. Your inner history buff will appreciate The Baptistery of St. John and Palazzo Vecchio. You'll find plenty of places to visit near Florence: Siena (Torre del Mangia, Piazza del Campo, & more). Next up on the itinerary: snap pictures at Ponte Vecchio, indulge in some culinary diversions at a local gastronomic tour, examine the collection at Museo di San Marco, and take an in-depth tour of Basilica di Santa Croce. To see reviews, other places to visit, photos, and tourist information, use the Florence trip maker tool . Traveling by train from Rome to Florence takes 2 hours. Alternatively, you can drive; or fly. In September, daytime highs in Florence are 78°F, while nighttime lows are 59°F. On the 6th (Fri), wrap the sightseeing up by early afternoon so you can take a train to Venice. Kick off your visit on the 6th (Fri): wander the streets of Cannaregio. 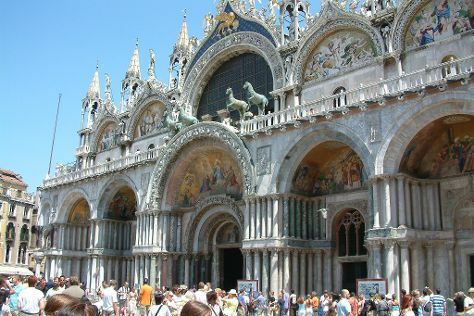 Get ready for a full day of sightseeing on the 7th (Sat): pause for some serene contemplation at Chiesa di San Zaccaria, admire the striking features of Basilica di San Marco, then appreciate the extensive heritage of St. Mark's Square, then explore the activities along Canal Grande, and finally admire the masterpieces at Museo Correr. To see maps, ratings, reviews, and other tourist information, use the Venice trip planning app . You can take a train from Florence to Venice in 2.5 hours. Other options are to drive; or take a bus. In September, daily temperatures in Venice can reach 77°F, while at night they dip to 59°F. Cap off your sightseeing on the 9th (Mon) early enough to travel to Barcelona. Start off your visit on the 9th (Mon): take in the architecture and atmosphere at Basilica of the Sagrada Familia and then pause for some serene contemplation at Barcelona Cathedral. Here are some ideas for day two: appreciate the extensive heritage of El Barri Gòtic. To find where to stay, photos, other places to visit, and other tourist information, read our Barcelona trip itinerary builder tool . Fly from Venice to Barcelona in 5.5 hours. Alternatively, you can do a combination of train and flight; or drive. Traveling from Venice in September, you can expect nighttime temperatures to be a bit warmer in Barcelona, with lows of 65°F. You'll set off for home on the 11th (Wed).